An 87-year old woman was pushed by burglars in her home in New Bradwell. 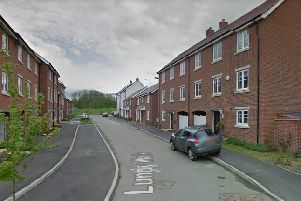 At some point between around 9.30pm and 9.45pm on Tuesday (May 24), the victim was at home in Bridgeway, New Bradwell, when she heard a loud bang at her front door. Moments later she saw two men inside her home. One man remained on the stairs while the other went through her sitting room. During the incident the victim was pushed in the chest by one of the offenders, causing her to fall back into her chair. The victim activated her community alarm which is believed to have frightened the offenders off. During the incident a carved wooden box, eight inches by six inches, was stolen, which has great sentimental value to the victim. One of the offenders is tanned, in his thirties or forties, around 6ft and of large build with broad shoulders. He had a local accent and was wearing a black turban on his head and a dark cloak. He had a dark coloured beard, although it is not known if this was real or not. The other offender was slimmer in build, in his thirties, and was wearing a white turban. Investigating officer Katrina Walmsley, of Milton Keynes Local CID, said: “This was a burglary in which the victim was a vulnerable person.